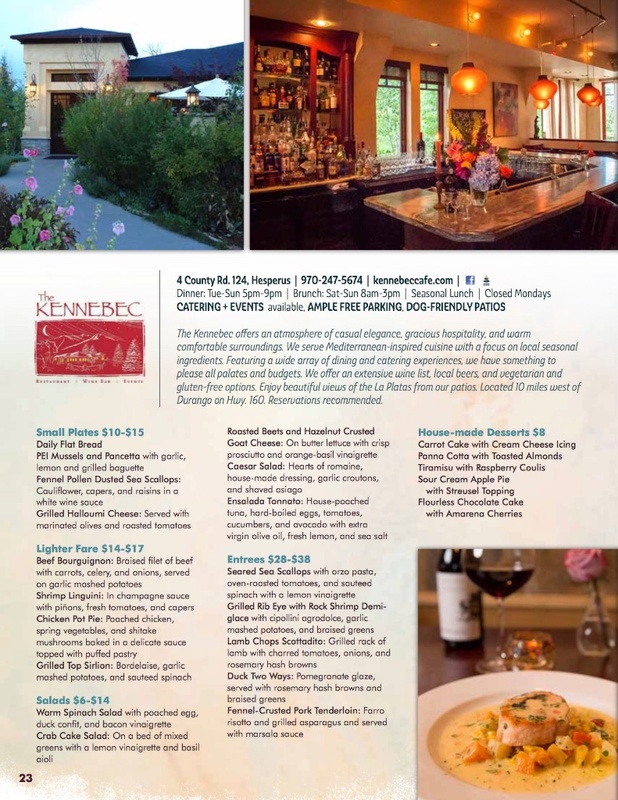 The Kennebec, located 12 miles west of Durango, provides a unique dining experience to the Four Corners. Inspired by the casual elegance of European cafes, you will enjoy warm comfortable surroundings, gracious hospitality, and gorgeous mountain scenery. Our Mediterranean inspired cuisine is highlighted by simple flavors that let local produce, meat and fresh seafood take center stage. Offering a wide variety of menu items there is something to please all palettes and pockets. In addition to our regular menu, we also feature a small plate menu for lighter appetites, gluten free and vegetarian entrees, nightly specials and wine pairing dinners. You can finish each meal with a flourish by indulging in one of our decadent signature desserts, which are designed to be shared. Our goal at the Kennebec is to keep our food as fresh, straightforward and seasonal as possible Serving lunch and dinner, Tuesday through Sunday with the addition of brunch on Saturday and Sunday. The soft glow of Italian lighting on the white marble bar creates an inviting ambience in which to explore our wide selection of wines from Italy, France, Spain and California. Offering a friendly non-intimidating experience, it is the perfect opportunity to expand your wine experience with our knowledgeable staff. The extensive wine list provides a harmonious relationship between food and wine. Join us at the bar for your next impromptu gathering! The Kennebec is the perfect destination venue for special events. Whether for a wedding, rehearsal dinner, family gathering or corporate meeting, we can create a memorable occasion for our clients. 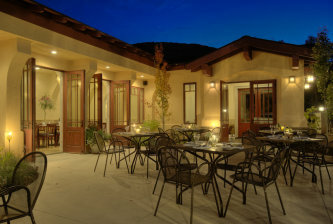 We offer versatile room settings, banquet facility, outdoor terraces and custom menus. We can accommodate parties of up to 150 guests on site and have access to larger venues off site. Call for more information when planning your next event. Like Us on Facebook, get updates & specials!